The SeedGrowers welcome Brentwood to West Street, looking to extend their two game unbeaten run without conceding a single goal in the process. The last two games have seen new signing, Tyler Corlett be influential in helping the Town shut out the attacks of both Dereham & Grays Athletic. After a ‘rocky’ start to the New Year, Graeme Smith’s men seem to have found their form of earlier in the season which saw them climb to the summit of the table at one stage. The two sides who go head to head tonight have already gone to battle this season, with two free kicks, one for each team resulting in a one-all draw at Brentwood’s arena. That match was also played on a Tuesday night and this game is Coggeshall’s last scheduled midweek game of the season, unless of course there are any postponements between now and the end of the season. The Blues arrive at West Street whilst sitting in fourteenth place in the league table, nine places behind the SeedGrowers. There recent form has not been particular great, having only collected four points from they’re last six outings – having amassed a total of twenty seven points from twenty three games to date this season. Within the ranks of Brentwood Town, is Nathan Fox who actually joined Coggeshall in the summer of 2018 but left after just a few appearances. Adults £10, Senior Citizens £5 & U16 £3. 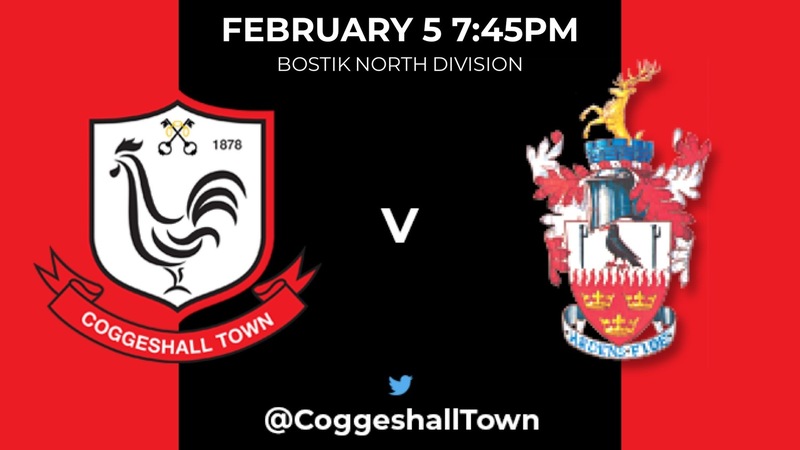 Stay up-to-date with the latest Coggeshall Town news results & information through the club’s Twitter feed at www.twitter.com/CoggeshallTown or search for, and follow, @CoggeshallTown. This service provides live match updates so if you can’t make the game; our media team are on hand to ensure you don’t miss a thing!